Depending on the layout of the room you can build clouds on an accent wall, above a chair rail, the ceiling or all over the room. Painted clouds will create a whole new energy to the room making a wonderful back drop to all of the other decor items you might have in the room. You can bring in a child’s favourite theme into the clouds, like a nautical theme, pony, angels, fairies, birds, unicorn, farm, transport etc. If you have a sailboat theme, create clouds shaped like sailboats. It’s easier than you would think. Where do I get the shapes? You can either make your own stencil inspired from from a picture, bedding, rug or fabric that you have in your child’s room or take a look at some ready made stencils which can save you some work. If you like the images above, right click on the picture and save the file onto your computer. Enlarge the image using a photocopier and make a stencil by cutting out the shape on thick card or stencil paper. The simpler the shape the better. Look at how successful the simple little duck above can be. Firstly (if you haven’t already done so), You need to click here to read and follow the guide on how to paint clouds. Make or buy your chosen stencil shape. Position your stencil and paint a cloud as (described in the guide) within the shape of the stencil. Make the paint quite tranparent fading it out towards the edge of the stencil so that you do not get too hard an edge. Remove the stencil and paint the other clouds as normal. For a bolder effect, how about painting a kite or a bunch of balloons in bright colours over the clouds? For an even easier option, stick on some stickers but make sure you leave the paint to dry thoroughly otherwise the stickers will fall off. If you don’t fancy following our method of cloud painting, you can buy a Cloudwash kit from the Magic Mural Factory which contains everything you will need in each kit to design and paint clouds on your walls. If you want to add the bunny, rocket, sailboat or duck to your sky we include a pattern with each kit. You trace the bunny right on the wall with the chalk (included in the kit) and simply fill it in. OK, so you’d really like a mural in your baby’s nursery, but perhaps you’re not feeling up to painting one. How about this for an idea? An interactive mural for your baby. 1) Stick your mural in a postition that your baby can reach. Above the crib/cot is good. 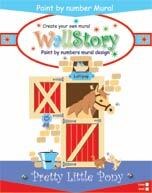 2) Place the easy stick stars around the mural in positions that your child can touch. When you need to take a break when painting a mural and you are using large brushes or a roller, wrap them in cling film or aluminium foil and they’ll keep from drying out for hours…even overnight. It saves having to clean the brush/roller until you have completely finished your painting. 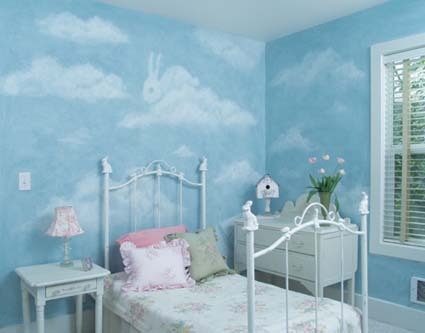 Whatever the age of your child, you can’t go wrong with clouds for a room theme. This is my all time favourite mural theme! There are many methods for painting clouds. Below is one way and a description of how to do it. There are other methods which you may find more suited to you for instance, Cloudwash is a kit that not only teaches you how to paint clouds on walls, but contains the paints, video, gloves, cloths and tools to complete the project. Personally I prefer to use water based emulsion paints (acrylic paint/house paint) with a water based glaze. Available at good DIY stores and craft suppliers. A piece of cheesecloth, about 18″ x 24″ inches big enough to form into a handsized ball. A piece of board approximately 3′ x 2′ or heavy cardboard pieces for practice. Pictures of clouds for reference. Paint your background sky a lovely sky blue. At the same time, paint a piece of board to use to practise on your cloud-painting technique. Let your sky colour dry for 24 hours before starting the clouds. (for example 1 cup of glaze to 1/4 cup of white paint) Mix thoroughly and pour into paint tray. Wet your piece of cheesecloth with clean water and wring out thoroughly. Keep this near at hand while you paint your clouds. You will use this to soften your sponge marks. Keep any pictures of clouds you have collected handy , so that you can refer to them for cloud shape ideas. Wet a piece of sponge with water, and wring it out completely. Dab it into the white paint, and remove excess paint on the edge of your tray. Use your painted blue board to practice forming clouds. First, play around with the sponge, dabbing on the paint. See what marks you can make by vaying the pressure of your dabs, twist and turn the sponge as you experiment. Take a look at clouds, they generally have a flat bottom. With your sponge, start dabbing on the board in a fairly straight line for the bottom of the cloud. Then start dabbing paint above this line, twisting and turning the sponge as you dab to create texture and variation. When you are satisfied with the general shape of the cloud, take your cheesecloth and make a ball with it. Dab gently over the cloud, softening the paint to make it more ‘cloudy’ looking. Build up the cloud with more dabbing towards the center adding texture and fading out towards the edge of the cloud. The centre of the cloud should be more dense. 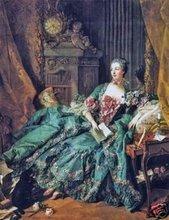 Soften the effect again with your cloth. Use this technique with all the clouds. When you are happy with your clouds on the practice board, head for your wall! Don’t make your first cloud dead center of the wall. it is not visually pleasing and looks unnatural. Start off-centre and down a bit either to the left or right. The size of your clouds depends on the size of your room, but if you take a room of about 8×10′ you could make your biggest clouds 20-24inches long and your smallest about 5-10inches. This is just an approximate guide and you can adjust your sizes to fit the size of your room.Don’t paint the clouds all the same sizes, look at nature, they are all different. Start with your biggest clouds and dot them randomly around the room. Stand back and look at how the wall looks. Fill in the spaces in between the big clouds with medium ones and then small wispy clouds. Keep standing back to look at the whole effect.Paint clouds wrapping round corners, to create continuity, around light switches, wall lights and whatever other features you have in the room. Over my next few posts I will show you how to add cloud shapes and other features to your clouds to add an extra dimension to the mural. After that we will look at other ways to create a cloud mural, so keep checking back to see what’s new. Would you like a FREE Paint by number mural? Good…but there is a catch! There’s always catch, but this one isn’t that bad. Here it is….I will send one of my paint by number children’s mural designs of your choice FREE if you agree to paint it in your child’s room and blog the whole process from beginning to end. Not that bad a condition is it? 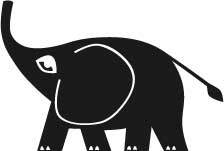 Take a look at this page of my website to see the designs you can choose from. I will be giving away one of these children’s murals to one suitable blogger. You don’t need any artistic skills to paint these murals. Let me know if you are interested and send me your blog details and I will contact you. If the response is good, I may repeat the offer in future months. The offer ends Friday 11th July, so hurry and send me your blog details! 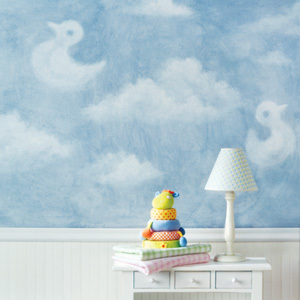 Nothing can sucessfully bring a theme to a child’s room as quickly and easily as a mural. It doesn’t take up space, and immediately sets the scene. You don’t have to spend a fortune on a professional mural artist either, which is good news since we all need to tighten our belts a bit with the credit crunch making itself felt. So, if I don’t hire an artist, how do I create this mural? Paint by number pirate mural! Have you ever coloured in a colouring book? Well, it’s that easy. Follow the map to find the buried treasure but be careful as you approach, the waters are full of hungry sharks. 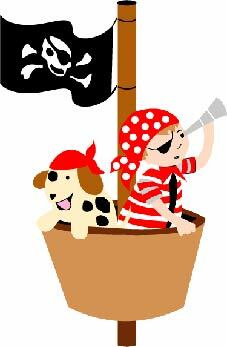 This Pirate Treasure map wall mural will delight even the littlest pirate and is available in 2 sizes. 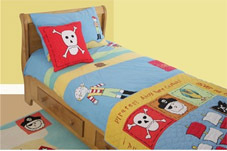 This paint by number Pirate treasure map can be personalised with your childs name. Team up the treasure map with the other pirate themed murals shown below for a deadly room of delight! Once you have your mural, you can sipmly accessorisewith bedding, cushions and a rug to complete the look and pull the whole pirate theme together. Add a keep out pirate sign to the door, and you’re done! If you need to mix small amounts of colour and need something to mix them on, use a paper plate. They are cheap and you don’t need to clean them afterwards.